Vac-Pac® is the industry-leading vaccine stabilizing powder developed by Animal Science Products that provides you and your flocks with stronger, more reliable vaccine protection. Vac-Pac® helps you achieve better results and higher returns on your valuable vaccine investment. Vac-Pac is superior to all other water-line delivered stabilizers as it greatly reduces the amount of time, energy, and extra supplies required to properly vaccinate your flocks – thus allowing you to more effectively and efficiently protect your birds. Higher stabilizing power and solubility means quicker vaccine prep—no more of the 15-minute wait times of competing products. Our stabilizing action is immediate. The stabilized vaccine diluent is ready to receive the vaccine as soon as Vac-Pac® has been stirred into the solution. Advanced granulation technologies that dissolve into the solution without all the dust. 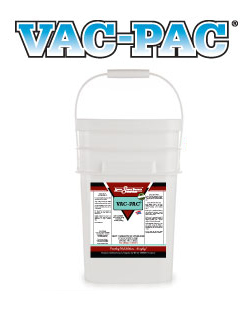 For more information on Vac-Pac®, download the spec sheet by clicking the link in the left column of this page. 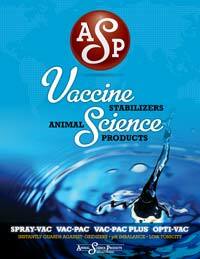 You can also download the full ASP Family of Vaccine Stabilizers brochure by clicking on the icon to the right.